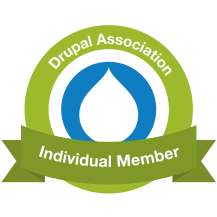 I'm currently serving as one of two community elected At-Large Directors on the board of the Drupal Association. The D.A. supports Drupal in a variety of ways, including maintaining drupal.org, running DrupalCon, and marketing Drupal to foster its adoption and community growth. If you use Drupal at all, you benefit from the work of the Association staff, and I couldn't be prouder of the work they're doing. The team really is incredible, and it's been a pleasure to get to know them more this past year. Serving on the board has also given me the opportunity to get to know the other board members, including the At-Large Director elected before me, Shyamala Rajaram. She has focused on helping the D.A. board and staff consider how to foster adoption and growth around the world, including in her home country of India where she is a Drupal agency leader and community organizer. Not only has she brought a unique perspective to these conversations at the board level, but she contributes with a humble, generous spirit that has led and served us well. Thank you, Shyamala! Her term on the board is expiring, and the Drupal community is currently engaged in electing her replacement from a very qualified list of candidates. The D.A. is a key part of the Drupal ecosystem, and each member of the board has the ability to influence how it uses its websites, events, and marketing programs to support the project and foster its growth. Its influence is often indirect, but it is no doubt consequential. Today is the last day to vote! Anyone who has used their drupal.org user account in the last year is eligible, and I encourage you to vote. Once you've reviewed the candidates, click the bright green "Vote now!" button in the top right hand of the election homepage. You can rank your choices in order of priority (1st, 2nd, 3rd, etc. ), but you can also just pick one person as your 1st choice if that's all the time you have. If you do vote, thanks for your contribution! Many of my longest friendships were born in the Drupal community. I’ve been attending DrupalCons, Drupal Camps, and other events since DrupalCon Barcelona 2007 and centered most of my professional life around contributing to the project as a developer and a teacher. In 2010 that included serving as a mentor in the Google Summer of Code program for a new contributor who wanted to work on Drupal Commerce’s affiliate module, bojanz. Bojan Živanović and I got to know each other that summer through many IRC chats and coding sessions. After he completed his project successfully, we met at DrupalCon Copenhagen and celebrated at McDonald's. I sure knew how to treat a friend! I later convinced him to join Commerce Guys’s development team based in Paris. He served on our client services team before diving head first into Commerce Kickstart 2.x development and then creating a whole suite of modules to support usage based billing for subscription services like Platform.sh. Around DrupalCon Austin in 2014, it appeared Bojan's mission with Commerce Guys might be complete. However, I saw an opportunity for him to develop further as a leader in our company and community. I was already busy leading client services with our U.S. team and then with acquiring and refocusing Commerce Guys around Drupal Commerce. It made perfect sense to me to appoint him to be project lead for Commerce 2.x. That decision has served Commerce Guys and Drupal Commerce well over the last several years. Bojan brought renewed vigor to the project and discipline around competitive research and automated test coverage that far exceeded my own. He's also proven to be an able mentor in his own right, helping dozens of contributors and whole agency teams learn Drupal 8 development in general and Commerce 2.x development in particular. Today is Bojan's birthday, and reflecting on our almost 8 years of friendship has obviously made me sentimental. At our first meeting in Copenhagen, my daughter Éowyn was just taking her first steps and wouldn't ever remember meeting Bojan. Today she sees him regularly during company Zoom calls and his occasional visit to our home in Greenville, SC. He's not just some random person from daddy's work, he's Uncle Bojan and a trusted friend. We're all wishing you a happy birthday, Bojan, and we're grateful for your years of contribution and leadership in our midst. I'll have to hit the 2.x queue this evening to send you a birthday present disguised as a patch. Drupal Camp Asheville is always well organized (props to April Sides et al; seriously, it's in the best of the best small conferences for venue, amenities, and content) and attended by a solid blend of seasoned Drupal users / contributors and newcomers. I live only an hour away, so I get to interact with my Drupal friends from Blue Oak Interactive, New Valley Media, and Kanopi on occasion, but then on Camp weekend I also get to see a regular mix of folks from Mediacurrent, Code Journeymen, Lullabot, Palantir, FFW, CivicActions, end users like NOAA, and more. This year we got to hear from Adam Bergstein as the keynote speaker. Unfortunately, that "we" didn't include me at first, as I managed to roll up right after Adam spoke ... but his keynote is on YouTube already thanks to Kevin Thull! I encourage you to give it a listen to hear how Adam's experience learning to work against his own "winning strategy" as a developer (that of a honey badger ; ) helped him gain empathy for his fellow team members and find purpose in collaborative problem solving to make the world a better place. I gave a presentation of Drupal Commerce 2.x focusing on how we've improved the out of the box experience since Commerce 1.x. This was fun to deliver, because we really have added quite a bit more functionality along with a better customer experience in the core of Commerce 2.x itself. These improvements continued all the way up to our first release candidate tagged earlier this month, which included new promotions, coupons, and payment capabilities. Lastly, I loved just hanging out and catching up with friends at the venue and at the afterparty. I played several rounds of a very fun competitive card game in development by Ken Rickard (follow him to find out when his Kickstarter launches!). I also enjoyed several rounds of pool with other Drupallers in the evening and closed out the night with cocktails at Imperial Life, one of my favorite cocktail bars in Asheville. I treasure these kinds of social interactions with people I otherwise only see as usernames and Twitter handles online.